The Golden Hawks will travel to Saskatchewan to take on the Huskies in a pre-season game commemorating WLU’s 2005 Vanier Cup-winning team. 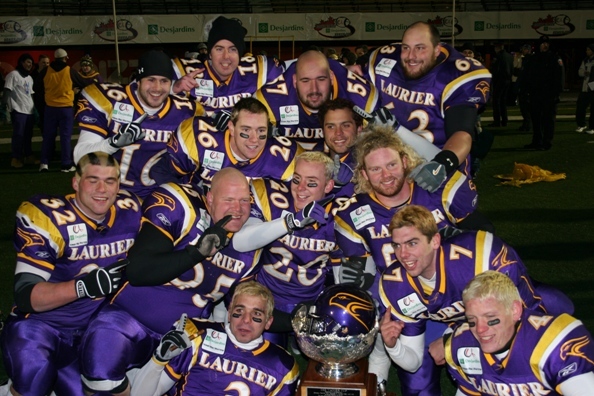 It’s been 10 years since Laurier won the Vanier Cup. We would like to extend an invitation to our alumni in the Saskatoon region or anyone else making the trip out there to join Laurier President & Vice-Chancellor Dr. Max Blouw, Vice-President: Academic & Provost Dr. Deborah MacLatchy, Director of Athletics & Recreation Peter Baxter, and Vice President of Student Affairs David McMurray for a pre-game reception to celebrate the Hawks vs. Huskies Vanier Cup Anniversary re-match. This will be a great opportunity for alumni to meet Laurier’s senior administrative staff and to reconnect with fellow Golden Hawks before the kickoff of the game at 7pm. This event is free to all alumni and there will be complimentary appetizers and beverage served. Those who are interested in attending can RSVP here. I am more than happy to find a player in need for any of you newsletter subscribers. You may also have a specific position that you would like us to find a player for you. We are here to help facilitate. We raised $33,000 last year as a team and can definitely surpass that this year – please help us better that mark this year! Compete in everything we do: Guelph – Triple Victory Project, MAC – 13th Man Program, Western – Adopt-A-Mustang. We can definitely do more and raise more than these teams – everyone can help! Access the online registration form. Ticket prices increase on game day, so make sure you get them in advance. Reserve your seats now for what is sure to be an exciting home schedule in 2015. Adult packages are available for $54.95 while alumni and seniors are priced at $41.95. For more information, click HERE. The Cambridge Lions season came to an end Saturday night in Windsor as they lost a hard fought playoff game to the Essex Ravens 45-20. Considering the number of injuries the Lions suffered to key players this season, it is a great accomplishment to make it as far as they did. Help us expand our subscribers list and send me (mfaulds@wlu.ca_ the email address of anyone interested or complete the online sign-up form in the sidebar, please and thank you!